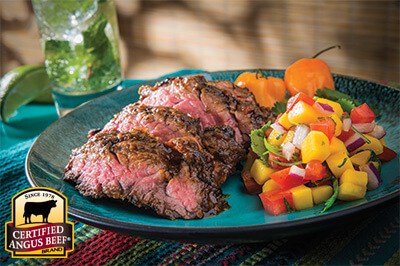 Similar to skirt steak, with robust flavor. May be marinated before cooking. 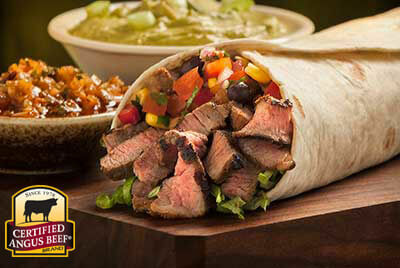 Sirloin Burritos with Red Chimichurri Sauce take Mexican night to another level. Incredible freshness and flavor to enjoy with every bite. Cut sirloin flap into 3-inch wide pieces, 1/2-inch thick, cutting with the grain. Pieces will vary in length from 4-6 inches. Place in a shallow baking dish. In a food processor or blender combine onion, garlic, cilantro, paprika, red pepper flakes, vinegar and oil by pulsing to a finely chopped consistency. 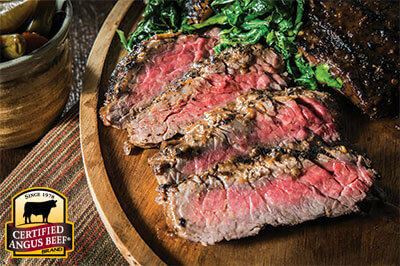 Coat sirloin slabs evenly with two cups of sauce, cover tightly with plastic wrap and refrigerate overnight. Reserve remaining sauce in a serving bowl. Preheat grill. Mark tortillas on hot grill 15 seconds per side; keep covered and warm. Pat sirloin dry with paper towels, season with salt and grill over high heat to medium. 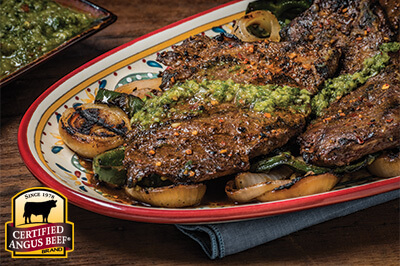 Slice thinly against the grain and serve rolled in warm tortillas with chimichurri and optional toppings.